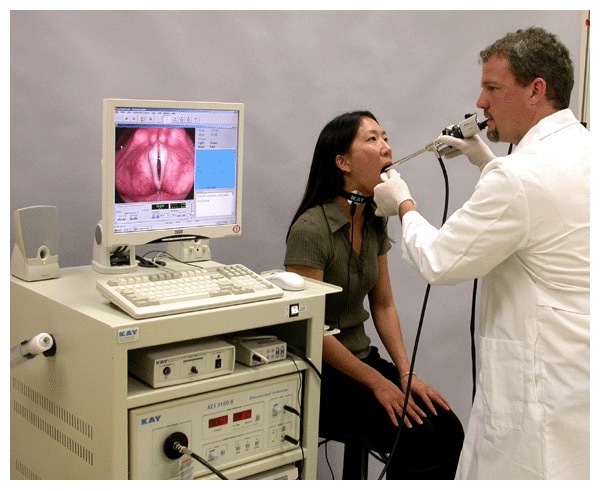 Laryngeal Videostroboscopy enables us to view the vocal folds (vocal cords) to see how they vibrate. The vocal folds vibrate too fast for the human eye to see the actual vibration. During conversational speech, the vocal folds of the typical male vibrate an average of 100-130 times a second, and for the typical female, the vocal folds vibrate an average of 190-220 times a second. Laryngeal Videostrobscopy uses a strobe light to create a series of images that appear to be slow motion vibration of the vocal folds. This allows us to assess how well the vocal folds are vibrating and to see any problems with how the vocal folds are functioning. As speech-language pathologists, we do not make medical diagnoses. We use Laryngeal Videostroboscopy to assess how the vocal folds vibrate and function. But if we see something that looks unusual, or you report symptoms that are consistent with a medical problem, we will refer you to an otolaryngologist (ear, nose and throat doctor) for medical evaluation.